Hong Kong’s finest turn out for surely Sammo Hung‘s crowning achievement; a savage, intense action film that, despite blatant nods to other popular Vietnam war movies, still plays like nothing you’ve ever seen before. It’s a Dirty Dozen-style adventure in which an all-star cast play Chinese-American convicts sent by US intelligence into Vietnam on a suicide mission to destroy a stash of weapons before it falls into enemy hands. The mission is secretly cancelled at the last minute, so the team find themselves behind enemy lines, fighting for survival against the Vietcong. But assistance soon arrives. 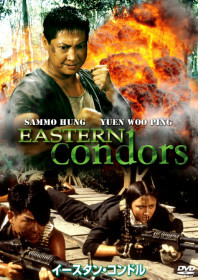 They befriend a dedicated trio of female guerrilla fighters (fronted by Joyce Godenzi – the future Mrs Sammo) and the high-kicking exploits of wheeler-dealer country-boy, Yuen Biao (whose uncle is played by the Oscar-winner, Haing S. Ngor, from The Killing Fields). Yuen Wah plays a deranged villain; weedy, smartly suited with geeky glasses and a high-pitched giggle, he is the antithesis of a ruthless army leader until he explodes into a fury of electrifying kung fu that demands the best from Sammo. The finale – set in a nuclear bunker – is one of the best showdowns in a Hong Kong movie, and rounds off a breathtaking film that needs to be seen at every opportunity.